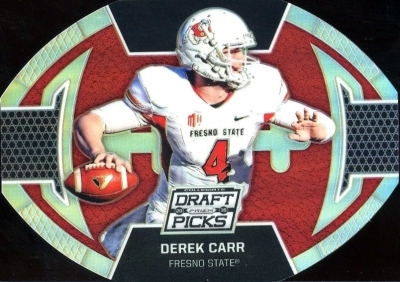 Following up the brand's debut in 2015, 2016 Panini Prizm Collegiate Draft Picks Football again showcases an NCAA focus on the top incoming names for the NFL. Hobby boxes increase the autograph yield to five and also contain multiple Prizm parallels. 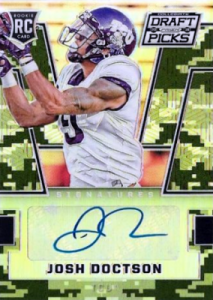 The Prizm base set covers the key NFL Draft prospects and is enhanced with a rainbow of parallels, including Camo (#/199), Purple Flash (#/99), Tie Dye (#/49), Red, White and Blue (#/25), Gold (#/10), Green (#/5) and Black Finite (1/1). Growing from two autographs to five autographs per box, signed options include Base Autographs numbered to 199 or less. There are also All-American Autographs and Alumnus Autographs that include veterans and retired players while Team Trademark Autographs (40 cards) work with the incoming rookies. 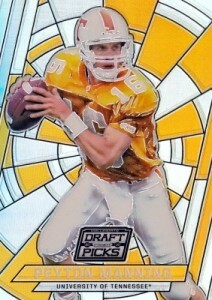 Many of the signed card will feature the various Prizm parallels with limited print runs. Presenting more design variety, basic inserts include the colorful Stained Glass (1:6 packs) as well as Football (1:12 packs) and Helmet Die-Cuts (1:12 packs). Collectors will find two of the Stained Glass inserts and one of each die-cut in every box. 2016 Panini Prizm Camo Braxton Miller Draft Picks RC Auto card #138 199!! *It appears that cards #148 and 189 were not issued in the release. Does anyone know if this release has been pushed back? Any info would help. thanks a bunch. Matt � Not delayed. It still releases 4/13 (today). The shop I work at had a base card #148 Jacoby Brissett come from a box. The card was sliced horizontally 4 times, but the strips were still connected to form a full card. Not bad for my first box. Didn’t realize that I hit a home run with an auto Brett Favre Alumnus card. At first I thought… interesting… it looks different from the rest. Well it turns out to be a nice card. Anyone know the odds of the all-american and team trademark autos. 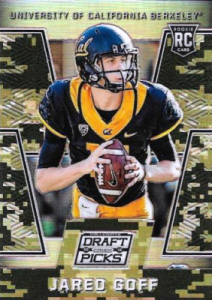 So with the alumnus autos the blue , red, and camo prizm are #/5? Or just the camo? John � Just the Camo are numbered to 5. 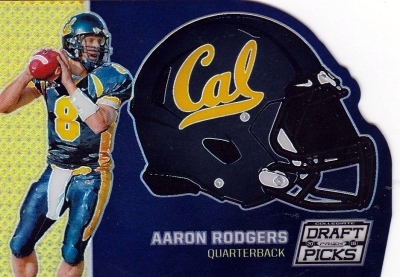 I have been in on multiple case breaks of this product and none of them have yielded any Blue or Red prizms. I bought a few singles separately but these are the only parallels I haven’t seen in a case break(other than the Black 1/1’s). Are the Reds and Blues exclusive to Retail? The jumbo hobby boxes are a great value. 2016 PANINI PRIZM DRAFT PICKS FOOTBALL HOBBY SEALED BOX - IN STOCK!